While I moved to California 4 years ago, I was still needing to travel back and forth to the East Coast for treatments, and my timing was such that I was always finding myself spending the Summers at back at home in Cohasset. So with my very first official full Summer here....the heat has been quite an adjustment. Daily temps seem to be averaging between 105 - 112 degrees in Topanga, with a few days of 90 degree relief scattered in between..so it has been hot. Like, epic hot. So I've been consuming a bountiful array of cooling foods + drinks including watermelon mint smoothies, cucumber salads, hibiscus lemonades, and tons of raw ice cream. I've also been on a bit of kick to offer deeper support my skin. The dry heat + California sun is changing my skin in ways that I wasn't prepared for. So I'm doing my best to ramp up my intake of skin boosting foods like Tocos, Pearl, Schisandra Berry, + Collagen/Gelatin to help keep it supple, hydrated, + nourished. I didn't necessarily set out to create a beauty ice cream, but this blend is quite the combination. WILD MAINE BLUEBERRIES :: I have been following bits + pieces of Anthony William's (Medical Medium) immune boosting protocol by adding in Wild Maine Blueberries into my smoothies + salads. According to Anthony, "These little gems are the top health tonic you can find. Turn to wild blueberries for immune system support, tissue repair, anti-aging, digestive cleansing, ADHD management, extraction of heavy metals from your system...the list goes on. You also want these in your toolkit for prevention of brain diseases such as Alzheimer's. (Don't confuse them with their cultivated cousins, which are larger, slightly lighter in color, and still healthy, just not anywhere near as life-changing.)" TOCOS :: a concentrated source of vitamins E + antioxidants and is anti-inflammatory, detoxifying, + immune boosting. 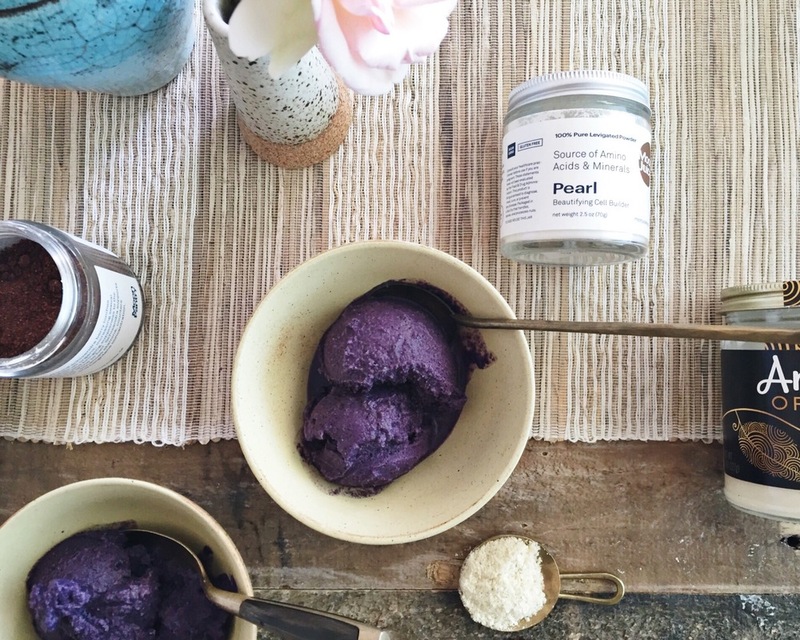 PEARL POWDER :: according to MoonJuice, "Pearl has been used for centuries as a beautifying antioxidant and potent source of enzymes, biocompatible minerals and amino acids. This adaptogen delivers dozens of essential trace minerals into the bloodstream for bone and cell building, longevity, joy and overall glow." SCHISANDRA BERRY :: also according to MoonJuice, "Schisandra Berry tonifies and heals all organs. It’s legendary for increasing sexual functions and bringing suppleness to the skin and shine to the hair. Schisandra supports the liver, enhances stamina, counters stress and heightens concentration." COLLAGELATIN POWDER :: supports rapid repair of tissues + joint mobility. Helps to promote hydrated skin. Add to your ice cream maker + churn for about 20 minutes.